On a second-floor rooftop at NASA’s Ames Research Center in Silicon Valley, Abraham Ishihara opens an electrical cabinet bursting with hundreds of wires. Each wire feeds data from an adjacent array of solar panels, helping him collect detailed information about their performance and, perhaps, figure out how solar panels age. 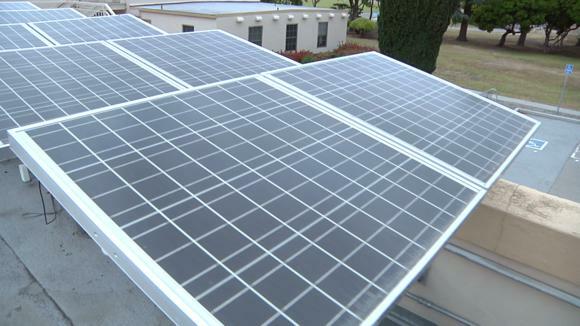 Ishihara, a senior scientist at Carnegie Melon University’s Silicon Valley campus, hopes the research will lead to new levels of efficiency in solar electricity generation. With billions of dollars spent on solar installations each year, it’s an important question. The information he’s gathering comes from sensors embedded in the array, and a large screen nearby displays a representation of the solar panels’ health. Most show up as green, but some are red—an indication of possible overheating. “Our goal is to better understand the mechanisms that lead to performance degradation,” said Ishihara. Temperature is thought to be one such mechanism. Sometimes, parts of a panel reach over 100 degrees Celsius and if that happens day after day, it can lead to permanent damage. It’s often caused by a mismatch between the performance of one part of the panel and another, which causes overall performance to suffers. That has a knock-on effect on the performance of the entire array. “These types of imperfections can worsen over time; it’s that’s a process we want to understand,” he said. So since 2010, Ishihara has been collecting detailed data about the performance of his panels to try to develop a model for performance and degradation that can be applied to other systems. The research continues, but his biggest take-away so far is that in the battle against dirt and dust, rain might actually make things worse, not better. Rather than cleaning a solar array, rain can lead to dust accumulating in the corners of each panel, which can cause significant heating.